The NRC is ignoring some construction problems that the NNSA has acknowledged at the MOX plant – incorrect installation of piping and cable trays. There are indications that CB&I AREVA MOX Services employees signed off on this work even though it was improperly done, so the question of fraud hangs in the air. Claiming that the problems are not “safety related,” the NRC is refusing to inspect or investigate. So, just who is properly monitoring constriction of the $12.7 MOX boondoggle? With only one – yes, one – resident NRC inspector at the MOX site don’t count on the NRC to be on top of this debacle of a project. not soooooo smart for being soooooo smart. and, unfortunately we don’t know how to manage it yet. #safetyfirst, #CleanUpAfterYourself, #RealNuclearWasteconfidence before we can continue with uncontainment of the waste we already have. Quote: “Currently, the U.S. does not use plutonium fuel in its power reactors.” A true statement, tell us why please. Could it be to prevent nuclear weapons proliferation because Plutonium MOX Fuel may be utilized for nuclear weapons? The blog post was updated again and re-posted this morning. Where is the “revised blog” and the comments that were posted in response to the original blog? They appear to have been taken down. Why? Great Comment Chris! Thanks for the education. 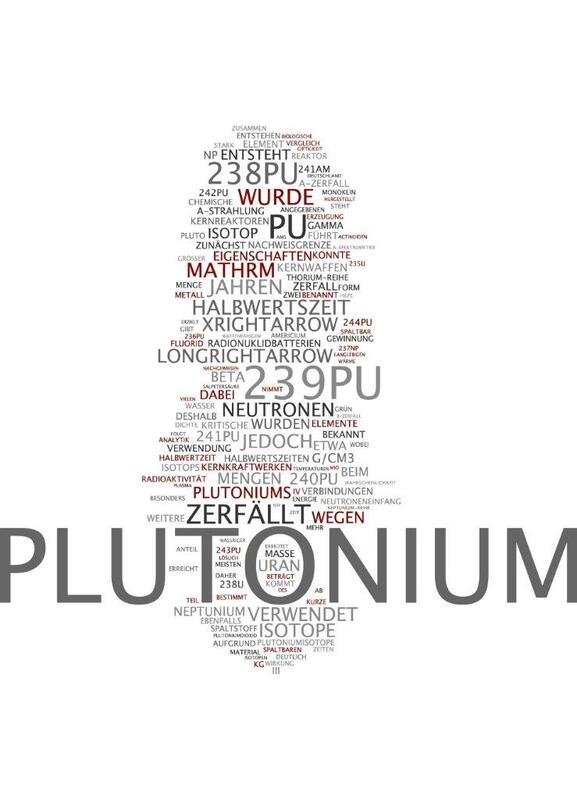 The purpose of blog was to provide a basic discussion of the various isotopes of plutonium and the differences between “reactor grade” and “weapons grade” plutonium. Additionally, the Department of Energy is responsible for plutonium disposition to meet the U.S.-Russia Plutonium Management and Disposition Agreement, which entered into force on July 13, 2011, and committed each country to dispose of at least 34 metric tons of weapon-grade plutonium withdrawn from their respective nuclear weapon programs. The U.S. NRC was granted regulatory and licensing authority over the Mox Fuel Fabrication Facility under the Strom Thurmond National Defense Authorization Act for Fiscal Year 1999. Comments related to plutonium disposition strategies should be addressed to DOE. For clarity, the blog has been revised. The statement you are referring to was inadvertently incorrectly worded. What was meant was when the “weapons grade” plutonium (as MOX fuel) is irradiated in a commercial nuclear reactor, the plutonium is converted into a proliferation-resistant form that can never again be readily used in nuclear weapons. The blog language has been revised. The claim in the last sentence that reactor-grade plutonium is not weapons-usable is incorrect and runs counter to the U.S. Government policy on the matter. This incorrect statement is a striking departure from both science and policy and must be corrected. MOX fuel – the fuel that will cost American Tax Payers billions upon billions of dollars in continued debt while facilitating nuclear proliferation. The fuel that will make the French owned Areva say “merci beaucoup” for your tax dollars. Don’t be misled by NRC Trojans bearing gifts and attempting to downplay one of the most extremely dangerous substances known to human kind that has the potential to kill millions.. There are serious technical errors and omissions in this blog that deserve to be corrected. “Plutonium (Pu) emits alpha particles—a type of radiation that does not penetrate and has a short range.” Pu also emits neutrons, gamma and beta particles, and x-rays. Plutonium and its compounds are toxic and accumulate in bone marrow. The best scientific evidence is that exposure to Pu increases the risk of cancer. Other negative attributes of Pu as a nuclear fuel are the following: Pu oxide forms on the surface of plutonium exposed to air; the oxide is pyrophoric, so greater use of plutonium in the nuclear fuel cycle poses an added fire risk; Pu has a low melting point, and unlike most other substances, increases in density as it melts (+ 2.5%) , making the material more not less reactive in a nuclear accident scenario; Pu is more susceptible than enriched uranium to criticality accidents, as the amount of plutonium required for a critical mass is about one-third that of uranium-235. The fact that the even-numbered isotopes Pu-240 and Pu-242 fission only at higher neutron energies, well above the thermal neutron spectrum used in most civil power reactors, is likely the origin of a mistaken notion, prevalent among supporters of “closing” the civil nuclear fuel cycle, that Pu-240—a supposedly useless “non-fissile” isotope that builds up steadily with fuel exposure in a thermal reactor—can serve to “denature” the explosive properties of the plutonium produced in spent fuel, often referred to as “reactor-grade” plutonium. In reality, for neutron energies above about 0.7 million electron volts (MeV), the fission “cross-section” of Pu-240 is smaller than that of Pu-239, the preferred plutonium isotope for making nuclear explosives, but larger than Uranium-235, the other preferred nuclear weapons material. As a consequence, i.e. the “bare critical mass” of Pu-240 – i.e. the minimum amount needed as metal at normal density to support a self-sustaining chain reaction with fast neutrons, before the addition of neutron reflectors and compression by high explosives – is 23 percent less than needed for a bare critical mass of weapon-grade uranium. Hence for all fuel burnup levels and at any time following discharge from a reactor, the critical mass of “reactor-grade plutonium” metal will be intermediate between Pu-239 and Pu-240, with the latter being more reactive than weapons-grade uranium. While nuclear explosives made of reactor-grade plutonium will not provide the same predictability of yield and long-shelf life of weapons fabricated from phase-stabilized “weapon-grade” plutonium metal, these attributes may not matter to terrorists or sub-national organizations bent on quick assembly of a nuclear explosive device. Finally, what makes plutonium in irradiated MOX fuel relatively unusable in weapons is not the isotopic “grade” of the plutonium but rather the fact that it is encased as a mixed oxide within sealed zircaloy fuel tubes containing a matrix of uranium, other actinides, and high-emitting fission products that makes the fuel bundles “self-protecting” for a considerable period, thus requiring remote shearing of the fuel elements and aqueous- or electro-chemical separation to extract the plutonium, a complex and costly endeavor. Ironically, however, the MOX fuel facility the NRC contemplates licensing itself relies upon a feedstock stream of 100% plutonium oxide that will support an explosive fast-neutron chain reaction if certain assembly parameters are met. The blog’s implication that licensing this MOX facility would reduce the risk of proliferation is misplaced. Well considering that 350 micrograms into the lung is a pretty certain death sentence, then 5 mg per M3 would be massive, further considering the average human breathes 80 M3 per day. That would be a massive concentration and extremely dangerous. You heard of the Beagle testing in which 255 out of 255 Beagles were killed by inhaled plutonium, usually the lung cancers killed them before the liver cancers did, although the liver cancers were also present, and bone tumors. Is this called being “over afraid”? Its pretty clear that MOX with it’s much higher nuetron density, is more prone to the Borax test type of Moderated Prompt Criticality, a form of runaway nuetrons and thus a form of atomic explosion. The MPC takes near perfect conditions to occur with standard fuel, but will occur a lot more easily with MOX fuel. Plus if you have a reactor or equipment pool accident and you are using MOX, then the accident scenario just got 100 times worse because now Plutonium is being released. So NO GO on the MOX, Dry Cask and forget the reprocessing, which is 10 times more expensive than dry cask anyway. 1- A Pu atom-bomb is larger far more difficult to detonate than the “simple” U235 bomb, it requires advanced pyrothechnics a terrorist group cannot develop. 2- Iran knows it, this is why they strive so much to enrich natural U to 93% with centrifugation, not taking the easy Pu. Concerning its supposed “toxic” aspects and “infinite” radiological life, one shall just consider that it is 180,000 times more radioactive than natural Uranium available eveywhere (some shale rocks in Sweden have 3 pounds of it per cubic meter). Take 3 pounds and devide it by 180,000 and you get the same radioactive flux as 7.5mg of hevillish Plutonium. Imaging media reaction if someone detects 5mg of Plutonium per cubic meter in a large field..!! So much that 277 billion of Becquerels. A mediatic storm would be immediately triggered. This shows how stupid is our mediatic system !